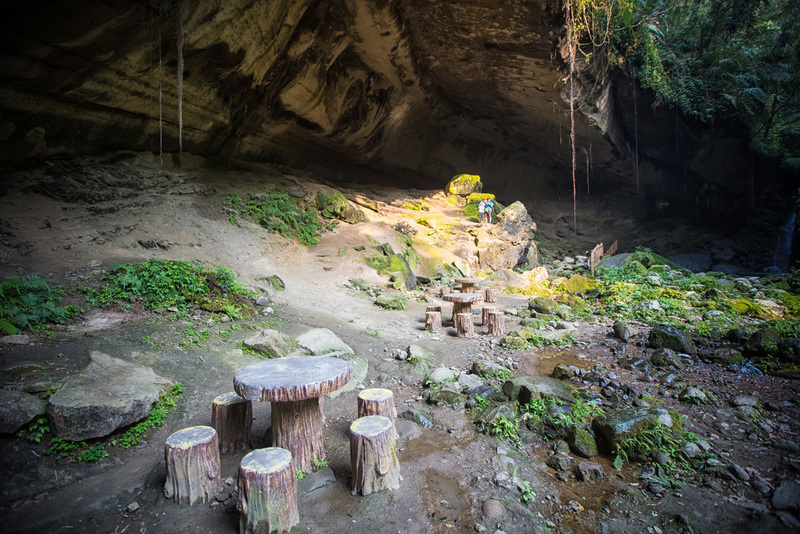 The Sanmin Bat Cave (三民蝙蝠洞) is a really large cave here in the mountains of Taoyuan county. While it doesn't actually boast any bats (or a batman) it is impressively large and it has a nice little waterfall next to it! The area around it is extremely quiet and one of the few places (apart from the top of a high mountain) where you can actually get some peace and quiet in Taiwan, something that I think we all need from time to time. 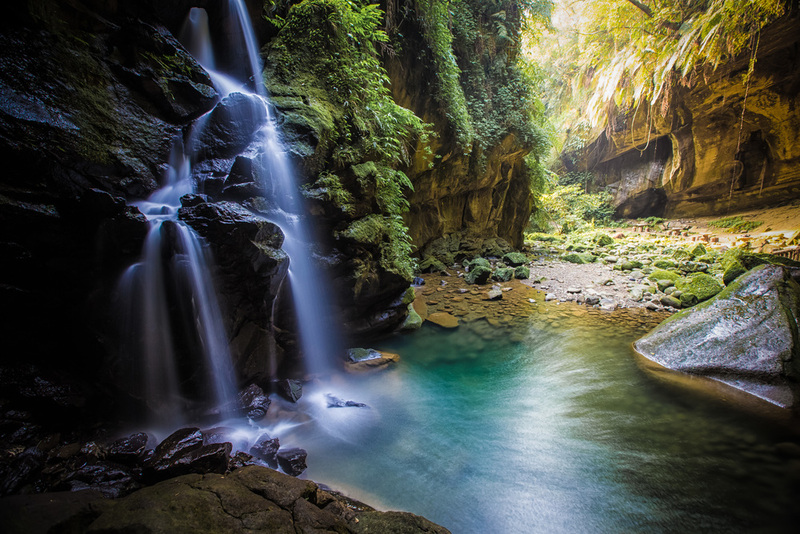 The cave which is also known as Shuilian Cave (水濂洞) is a natural rock cavern in the mountains of Taoyuan county and is thought to be the largest cave of its kind in northern Taiwan. The massive cave has a height of 20 meters, a width of 50 meters and is about 20 meters deep. 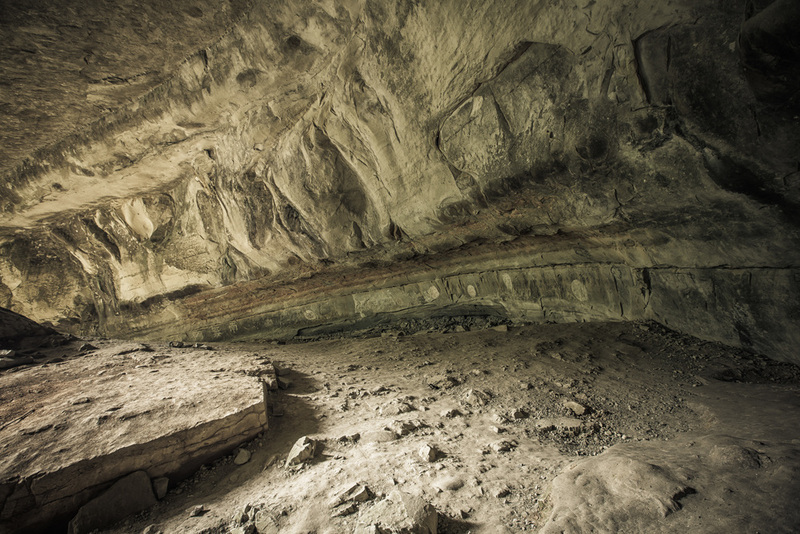 The area inside the cave seems expansive and it is estimated that over a thousand people could fit inside. You may even notice while standing inside the cave that the shape out of the mouth looks a little bit like the shape of Taiwan. Or maybe that's just me! The cave sits under a spring and there is often water falling from the top of it, which is where it got its original name: "water curtain cave" (水濂洞). If you are sitting inside, the falling drops of water make it seem like the water forms a 'curtain' separating the inside and outside of the cave. 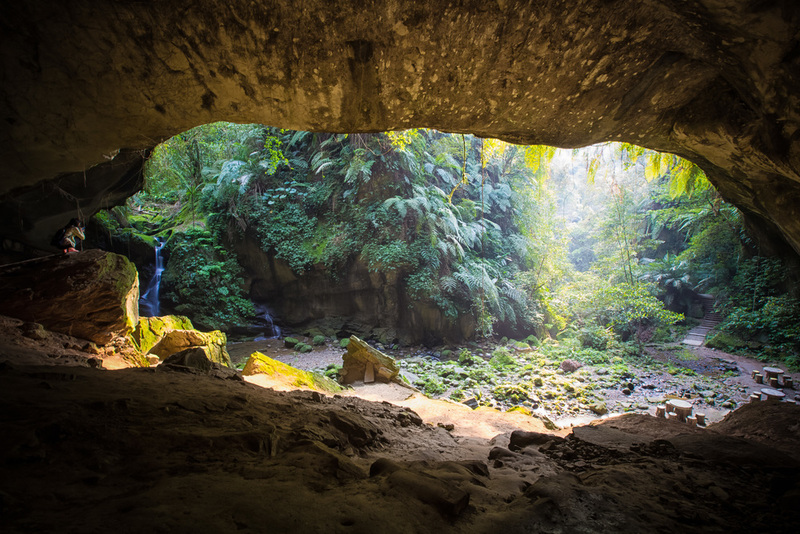 If you visit on a sunny day the effect is a lot cooler as the sun shines into the ravine while you are sitting in a relatively dark cave with a fine layer of water between the two. Batman's cave has a waterfall too! Next to the cave there is a small waterfall that flows from the spring above - The waterfall isn't large and the amount of water you see depends on what time of year you are visiting. 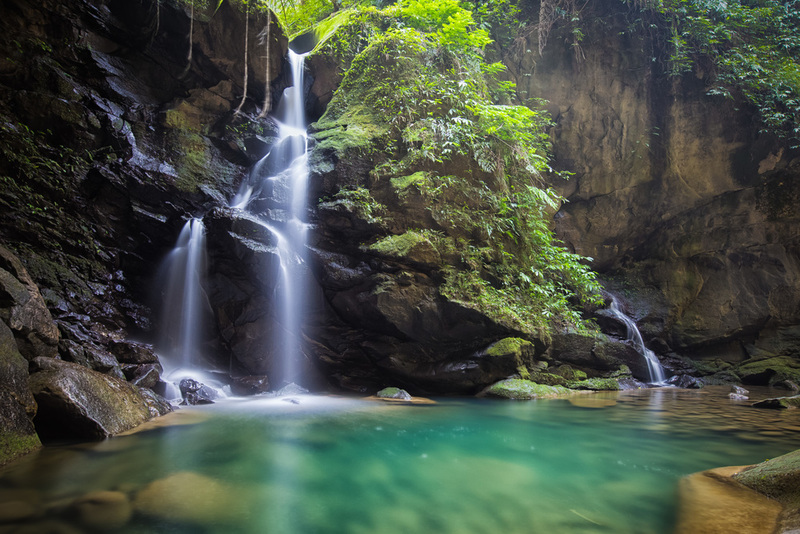 (If you visit during the wet season you'll experience a large waterfall and if you visit during a dry part of the year you're not likely to see very much at all.) The pool below the waterfall can be deep and it forms a small river that flows out of the ravine and down the path that you took to get to the cave. The waterfall is pretty cool and the pool in front of it would likely be a nice place to take a dip to escape the summer heat. The cave is in a ravine and is close to a damp water source which made it an optimal location for bats to make their home. The bats lived in the cave for so long that their guano (bat poop) had dyed the soil red making the inside of the cave a completely different colour than the soil on the outside. Unfortunately for the bats, in 1931 their home was discovered by the local Atayal (泰雅族) people and they quickly became a delicacy for the Indigenous tribe. The bats may have made their home in the cave for thousands of years, but it only took a few decades of human interference to drive them away. Today there are very few, if any bats left in the cave and if you see one you can probably count yourself lucky. 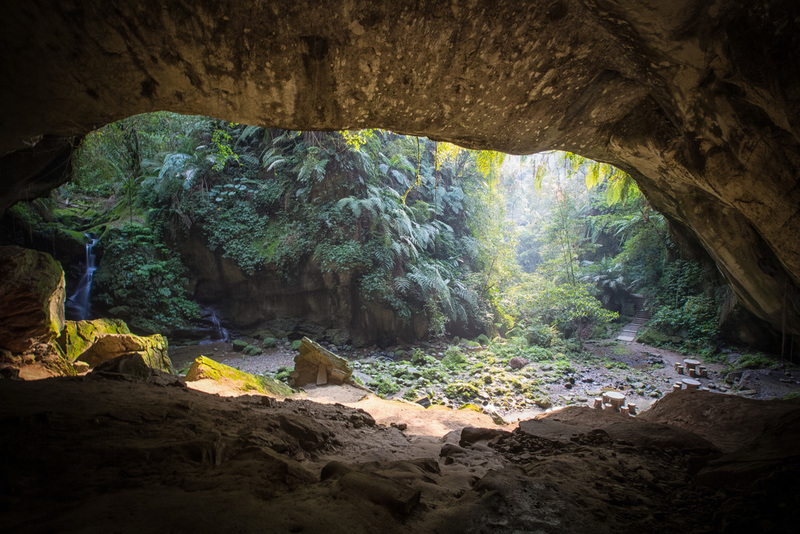 You'll find the cave in Sanmin village (三民村) which is known as the gateway to the Northern-Cross Island Highway (北部橫貫公路) and is close to Daxi Old Street (大溪老街), the Cihu Mausoleum (慈湖陵寢), the Daxi Tea Factory (大溪老茶廠), Xiao Wulai Waterfall (小烏來) and only minutes from the old TUBA Church (基國派老教堂). Getting to the cave requires a short ten minute walk from the parking lot and is quite accessible for anyone who wants to visit.